Earn $11.60 in Rewards credit (1160 points) What's This? 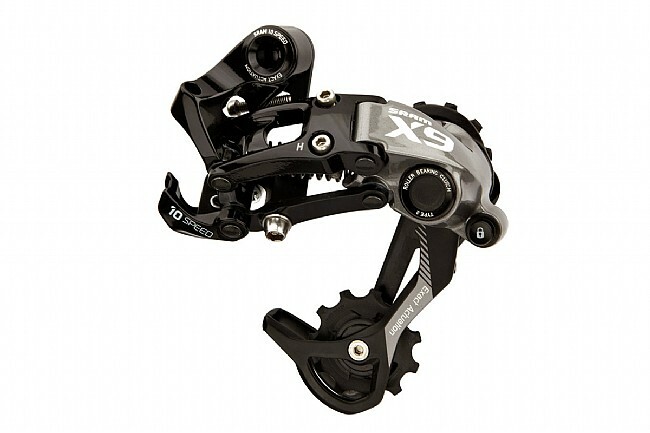 Engineered for performance and affordability, the X9 Type 2 Rear Derailleur is ready to ride. This anticipated "Type 2" model features a new one-way roller clutch which eliminates derailleur bounce and chain slap, and an integrated CageLock feature which allows for speedy wheel changes. Elsewhere, SRAM's smart blend of materials includes a carbon fiber and aluminum outer cage, aluminum inner and outer parallelogram links, and stainless steel hardware. This combination of materials offers durability and minimal weight at an affordable price. Needle bearing pivot points provide superior performance in messy conditions, and Exact Actuation technology ensures precise and dependable 10-speed indexing. Replaceable pulleys with sealed bushings keep dirt and mud on the outside, where they belong. Compatible with all current SRAM MTB and Road shifters. Available in Grey with a Medium or Long cage. 36T max. cog. Chain wrap: 35/47T (medium/long cage). Actual weight: 250/270g (medium/long cage).